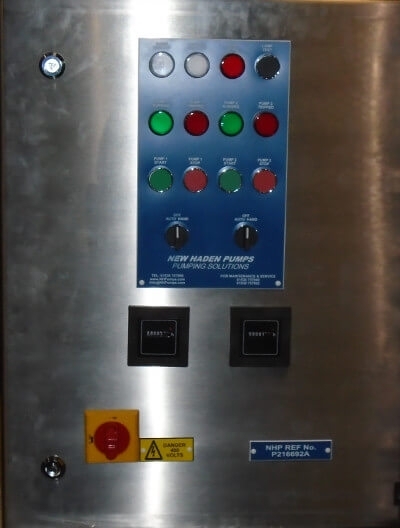 Special panels to incorporate PLC’s having the functionality to control other equipment, i.e. motorised penstocks, valves, etc. Special settings for grease, sewage, chemicals, etc. These units can be remotely monitored by NHP through a service contract. The Alert-Pac is approx 200x200x210. Power supply required is single phase mains 220volt and earth and can run off a 13amp socket. It has internal battery back-up. A BT landline and SMS system are available. The Alert-Pac can be mounted next to one of our existing pump panels and provides three separate warnings. These are taken from the ‘Volt-Free’ contacts in our pump panel. These are suggested alarms from existing NHP panels but they can be common together, e.g. Pump 1 or Pump 2 failure. There is no limit to how many warnings can trigger a single alarm – For example one pump set can have all it’s warnings common for alarm 1, a second pump set common for alarm 2, and a third pump set for alarm 3. The Alert-Pac can be used to send alarms for other systems, such as Air-conditioning, Freezer failure provided there is a set of volt-free contacts available from the Air-Con/Freezer/etc. The Alert-Pac can be mounted adjacent to the pump panel or within 20 metres as standard. If required further away, please ask. Alert-Pac can call up to three numbers in sequence and will continue to send until the call is acknowledged by one of the phones. This is done using the receiving phone keypad. The Alert-Pac has a ‘Power’ lamp and three other lamps, one for each alarm condition so can be used as a remote panel (e.g. Security Office) and dial-up unit.